Iranian Foreign Minister Mohammad Javad Zarif heads into a negotiating session in Switzerland. One of Zarif's strolls with Secretary of State John Kerry was too much for some in Iran to bear. Mohammad Javad Zarif, Iran's foreign minister and chief nuclear negotiator, presents a puzzle. To some, his flawless English and soft manner offer the picture of a pragmatist eager to bring his country back into the world community. To others, his Western credentials are a mask. "Zarif is the most effective diplomat Iran has had since the 1979 revolution," said Karim Sadjapour of the Carnegie Endowment for International Peace in Washington. "That said, Zarif offers an unrealistic portrait of the Iranian government, because if the men who controlled power in Tehran all thought like Zarif, there would have been a U.S.-Iran rapprochement decades ago." Reuel Marc Gerecht, a senior fellow at the Foundation for Defense of Democracies and a former CIA officer, sees it differently. "He's an Islamic revolutionary," he said. "Revolutionaries come in a number of models, and Zarif is the expatriate, mild-mannered model." In some ways, Zarif's image mirrors that of his U.S. counterpart, John Kerry, who is also accused by conservatives at home of wanting an Iranian nuclear deal too much. After he went for a 15-minute stroll with Kerry in Geneva in January, Zarif was assailed for betraying the revolution. 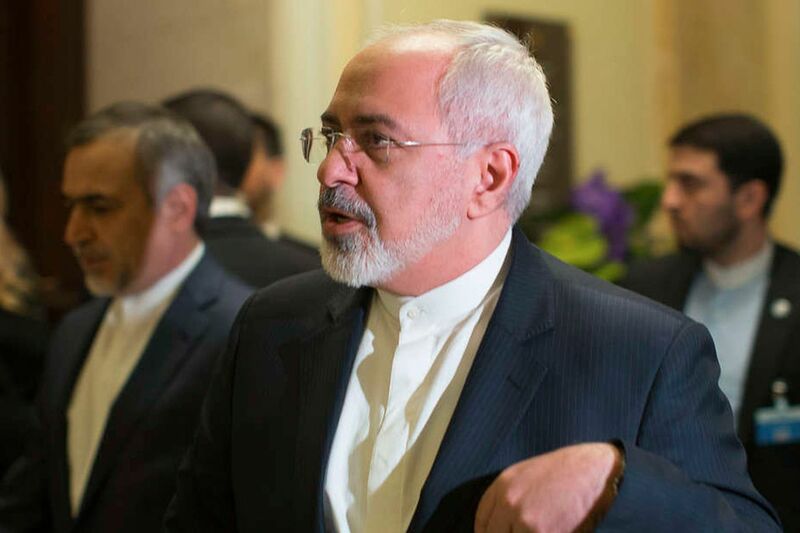 Fending off accusations of softness, Zarif made much of reports that he had been heard yelling at Kerry. He told a university student group that Iran's supreme leader, Ayatollah Ali Khamenei, had asked him to smile more rather than shout. Since the election of President Hassan Rouhani in June 2013, talks between U.S. and Iranian diplomats have grown routine. Zarif and Kerry, who call each Javad and John, have met eight times this year to try to cut a deal that limits Iran's nuclear program in return for lifting economic sanctions. "Zarif was appointed with one main mission: to remove the sanctions," said Alex Vatanka, a senior fellow at the Middle East Institute in Washington. In November 2013, Iran and the six powers - China, France, Germany, Russia, Britain, and the U.S. - signed an interim agreement under which Iran limits some of its nuclear programs in return for about $7 billion in sanctions relief. Now, a deadline is approaching to reach a final deal. Zarif has had to navigate political shoals. He rebuked 47 Republican senators who sent a letter to the Iranian leadership warning that any agreement could be nullified "with the stroke of a pen" by the next president. Zarif said the senators had no understanding of the "nuances" of the U.S. Constitution and were in danger of advocating a violation of international law. His troubles at home have been legion, especially after the walk with Kerry. Javad Naghavi Hosseini, spokesman of parliament's National Security and Foreign Policy Committee, compared the stroll to treason. While he has no political base, Zarif appears safe since he has the backing of the supreme leader, whom he has known for decades. "Khamenei likes Zarif, and Zarif will do whatever Khamenei asks him," said Hooshang Amirahmadi, a professor at Rutgers University, who has known Zarif for 25 years. Born in 1960 into an affluent, religiously conservative family, he grew up in a house with no TV or newspapers, a biography says. In 1977, with the help of a family friend, he avoided the draft and left for a prep school in San Francisco, enrolling later at San Francisco State University. He was involved with the Muslim Students Association at Berkeley but continued his studies after Islamic revolutionaries overthrew the shah. He returned to Iran in the summer of 1979 and married before heading back to the United States. Although his two children were born in the United States, he downplays the American influence on his life. "Even now Western lifestyle feels strange to me," he said in the book. After the seizure of the U.S. Embassy, which Zarif calls "the Den of Espionage," he enrolled in international relations studies at Columbia University. He was hired at Iran's mission to the U.N., writing letters and issuing visas. After the Sept. 11 attacks, Zarif was among the Iranian diplomats urging greater engagement with the West. With the 2005 election of Mahmoud Ahmadinejad, who espoused a more bellicose foreign policy, Zarif became isolated. Two years later, at 47, he was forced to retire. He taught at the foreign ministry's university. He kept a low profile during the 2009 protests against the disputed reelection of Ahmadinejad. In 2013, with the sanctions wrecking the Iranian economy, Rouhani was elected and Zarif was brought in from the cold as foreign minister. Zarif has not been consistent on sensitive matters. In 2013, he sent New Year's greetings to Jews worldwide via Twitter. Yet as ambassador to the U.N. he defended Ahmadinejad's statements challenging the Holocaust. And after his goatee was chastised by clerical leaders as being insufficiently Islamic, he grew it into a short beard. He has also sharply reduced his social-media activities. Last year, there were no Rosh Hashanah tweets.